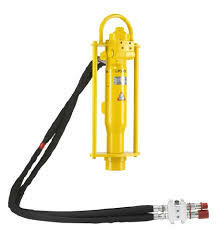 The Atlas Copco LPD-HD RV post driver is available in Ithaca NY, Rochester NY, and Upstate NY from the Duke Company. The LPD-HD RV is the perfect all-round driver. It has an built-in anvil and a front end that allows for a quick mount of adaptors and bushings for small diameter rods. Special composite guiding bushings — called PTFE — protect the zinc or copper surface from the driving rod. The sliding surface of the composite material permits smooth, low-friction operation. The push-down trigger system is perfect for driving light fences, tent stakes and ground rods. A remote valve gives you extra reach. The LPD-HD RV comes with a two foot long tail hose. It has a remote on/off valve, which allows you to activate the driver when it is placed on top of tall posts. There are several adaptors for our hydraulic drivers.